I only sometimes like Kate DiCamillo. I know, to plenty of readers, that is sacrilege. I'm sorry, but I just can't help it. I don't go into each book expecting to love them, or to be wowed by the story, transported from the real world to somewhere magical. I've been burned before. And then I read Flora and Ulysses and I think I'm in love. This isn't a normal story. The characters are very strange. Flora Belle Buckman describes herself as a cynic. Her parents are divorced and she lives with her mother, a romance novelist. Her father lives across town in an apartment. Flora really misses her dad. They used to read a series of comic books together, The Illuminated Adventures of Incandesto. She also reads a lot about how to spot criminals and villains and some worst case scenarios where she has learned what to do in many precarious situations. 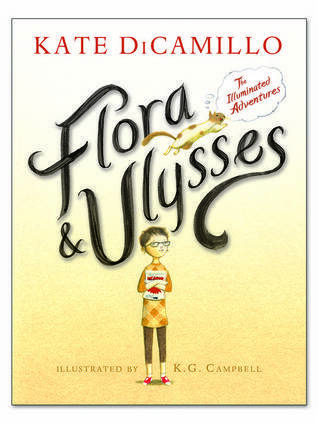 Flora saves a squirrel, who she names Ulysses (for the vacuum he got sucked up into) and takes in, hoping that he is developing super powers and that they will be able to fight crime together. She also meets some fascinating characters. Her next door neighbor, Tootie (who accidentally sucked up the squirrel in her monster of a new vacuum cleaner), Tootie's great nephew William Spiver, who has been banished from his home and is claiming to be temporarily blinded by his recent trauma, and the very kind doctor who lives next door to her father. Each of these people believes in Flora and in Ulysses, something I didn't expect to find and about which I was absolutely delighted! I'm surprised by just how many people over at Goodreads did not seem to enjoy this book at all. Instead of just having quirky characters and constant grief rising up in Flora's life, she is a heroine who meets every challenge head-on. She's pragmatic, but hopeful. While her home life is more than a little troubling, she is still surrounded by sympathetic and supportive people. Campbell's illustrations are very well done and parts of the story are told graphically, which really adds to the whole superhero/comic book world that Flora is so fond of. I'm sure neither the author or illustrator is dependent upon my good opinion to be successful. Clearly, they were doing just fine before I even knew they existed. However, I'm grateful that they created these characters and that I got to spend a few hours enjoying their adventures. I feel the same about Kate DiCamillo. But now I will read this one. That is funny when you said the author and illustrator were probably not dependent on your good opinion to be successful. But hey, you convinced me! Joannemarie has read 21 books toward her goal of 110 books.